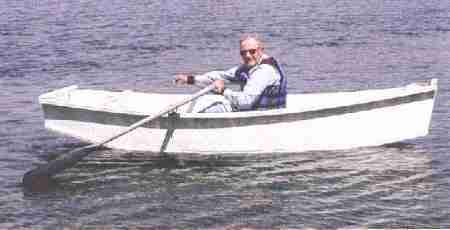 Toots is a 10' flat iron rowing skiff, about half way between serious skiffs like my QT and the typical pram. Toots will have the capacity to carry two normal size adults because it has enough rocker to float 450 pounds with its ends still well clear of the water. The prototype was built by Barry Targan of Greenwich, NY. As you can see in his solo photo, there is a lot of capacity left. Barry carries his Toots in the back of his truck but this boat may be one of the easiest to cartop. Sometimes a longer boat will actually load to the roof better than a shorter one, depending on the size and shape of the car. But unlike a longer boat Toots should get by with no ties to the bumpers, something to keep in mind now that cars have molded plastic bumpers with nothing to tie to. For that matter, most new cars don't have roof gutters to take a serious roof rack but the bike stores seem to have roof racks that clamp to thin air. I drew Toots as a taped seam boat although it could easily be done with conventional nail and glue chine logs as Barry did. I'm pretty certain that the taped seams have advantages beyond the obvious ones of fewer lumps and bumps and lighter weight. A proper taped seam has all the seams and gaps filled and closed to the moisture that usually makes a nailed chine joint the first place to rot. Then again, Toots would be a good project to do with children and using the conventional wooden chine log would avoid the specter of kids brewing up pots of epoxy. Toots needs only two sheets of 1/4" plywood. No jigs or lofting required.